Pragmatic Woodworker: That'll Do, Pig. That'll Do. I finished the construction of my Civil War reproduction folding table from the October 2013 issue of Woodworker's Journal . I'm glad to be done, but like the porcine star in the movie "Babe", I did something notable, but I still feel like a pig. As stated in a previous blog entry, I made a major league screw up on one of the legs. I decided to keep the screw up as a reminder to be more careful in the future. 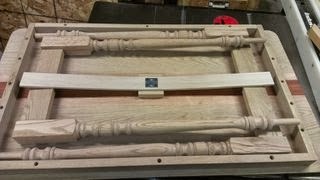 The cross brace is made from poplar instead of white oak like most of the table. I found poplar to be more bendy. Further commentary is a tad silly if you aren't familiar with the plan to begin with. The purpose of this post is to ask for finishing suggestions. 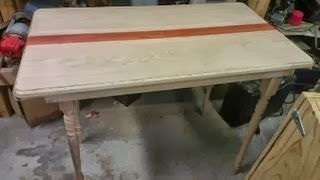 Currently I'm thinking Watco oil in 'natural' color with several coats of bleached shellac. The top will be further refined with rubbed in wax.